Sunday dinner as a child was a ritual for our family. Mom would prepare a beef roast, sided with English peas, carrots and roasted potatoes. As we grew older, the meal stayed the same. When the older kids left home, and the rest of us dwindled in numbers, the comfort food we knew faded to once a month, then finally to a couple of times a year. Cooking a beef roast in the oven was a comfort food, but now, we want to take that comfort food up a notch, and make it the way we love our meats today. Learning how to cook beef is easy, and a great way to update and relish a childhood favorite. A smoked beef roast is a little more unusual than some of our other smoked meats; this meat cut, traditionally is served a bit rarer than briskets and ribs. But it will be just as good. A similarity between the brisket and beef roast, is they both tend to be a tougher cut of the cow. The brisket coming from the front quarter section, and the beef from the rear, or rump area. When it comes to smoking and preparing this meat cut, you first need a few ingredients and supplies. Note: When it comes to choosing the wood for your smoker, different type of woods will have different impact on the meat taste. 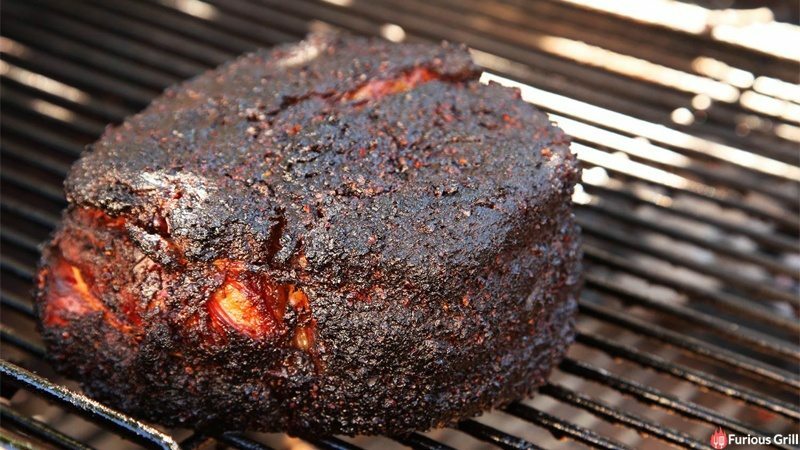 Choose the Mesquite or Hickory wood if you enjoy the stronger flavor and Pecan, Peach, or Apple wood if you want the wood to lightly enhance the natural juices and flavors of the beef​. Quick Tip: This cut looks so pretty and traditional with cotton twine wrapped around it, but does it serve a purpose other than being pretty? Yes, the intention of the twine is to gather the meat together. Left on its own the meat has extensions that if left unwrapped, would allow the meat to cook unevenly through the smoking process. Making a good and delicious beef roast starts with a proper preparation and ends with a proper smoking. So, after you have collected all the required supplies and ingredients, it is time to prepare your meat for smoking. There are different ways to prepare your meat. We are going to use a 2:1 pepper to salt ratio. An average size roast would use about ½ cup of coarse pepper to ¼ cup of coarse kosher salt. We are going to massage it in, tie it up and let it sit. After you have prepared your meat for smoking and have let it ​sit, it is time to go and start the fire. If you are using an offset smoker, you can start your fire with lump charcoal in a fire chimney. Once you are ready to dump the coals you can add your wood. If you are using an electric smoker, follow the manufacture's instructions and turn it on. In both cases, you want your cooking temperature to be as close to 225° as you can, throughout the cooking process, so make sure to check the temperature regularly. While you wait for your fire/smoker reach the recommended temperature, it is time to season your meat. Pepper and salt is it for us, but you have many other options, depending on your mood. Some enjoy injecting a beef broth to the meat to ensure the moisture is maintained through the smoking process. Some friends have rubbed fresh herbs like rosemary prior to smoking and then setting the cut on a bed of the herb of choice while it smokes. A good addition is roasting some garlic bulbs in the oven for thirty minutes at 400°, let them cool and rub the creamy garlic into the meat then add the salt and pepper. Because we are slow cooking, the garlic shouldn’t get a bitter taste during the smoking process. Although using a hard wood, like mesquite over a long smoke can tend to allow the garlic to absorb some bitter flavors from the wood. After you prepared and seasoned the meat the way you like it, now you are ready to re-approach your grill. Ideally the thermometer is close to the cooking surface, and it should be at 225°, perfect for making this kind of meat. Also, you should be prepared to add about 1 log for every 45 minutes, so get some extra logs near you. Doing so, will help you maintaining the required temperature easily. Also, you should have in mind that the total required time for properly cooking will be 4-5 hours. Now, take your meat and ​transfer it directly onto the grill. This ensures that the meat is vulnerable to your smoke during the process. The more smoke you allow in, the closer you are to reaching your culinary goal. Also, even though we have placed the meat directly on grill grates, we always try to keep the meat furthest from the fire as possible. This helps you in case the fire flares up and flames from the fire box briefly enter the smoking area. After you have placed the meat properly, you only have to be patient and occasionally check the temperature. You can enjoy a cold beverage of your choice. Take a sip, and check your gauge, repeat this step over and over. If your temperature dips below 225° to around 215°, get another log on the fire, but don’t touch the door to the smoke section. It’s easy to say, “Keep your fire at 225°F”. But when you are smoking something, how do you do that? First concern is, ‘the temperature is dropping but there is wood on the fire’. If this is happening to you, then your fire needs an energy source: Oxygen. Open the flue on the bottom of the fire box to increase the air flow. You will see the temperature start to rise very quickly. If your problem is just the opposite, ‘your fire is getting too hot’, your solution is just as easy. Some people think they need to spritz water on the fire. That will create a dirty taste in your fire pit. Close the flue a little bit, and close the smoke stack a little bit, monitoring the temperature as you go. Chocking the smoke stack will help to draw back the fire enough to get you into the temperature range you are looking for. Be aware though, if you choke out the fire too much you can end up putting your fire out. You have patiently waited for four hours. You occasionally sipped on your drink and enjoyed working by doing almost nothing. Now, it is time to open the door for the first time to check your meat. If you decided to use a strong flavored, hardwood for smoking, after about two hours you might put your meat into a tin foil pan and cover it with tin foil. Then, set it back in for two more hours at the same temperature. We decided to use pecan, and let it go the full four hours uncovered. Take a clean meat thermometer and probe as deeply to the center of your smoked meat. You want to hit an internal temperature of 150°-155°. This is the perfect temperature for your roast. Your cuts will range from medium rare to medium. Pull the meat off, and cover it, or wrap it with tin foil. To optimize the potential of your meat, let it sit still for 20-30 minutes after you remove it from the smoker/grill. This rest period will allow the juices within the roast to subdue and relax. The juices inside will naturally circulate within the body of the roast, making it more tender. Cutting into the roast without waiting will cause the juices to race out, and this will cause it to dry out quickly. When you are ready, transfer your roast to the cutting board and make the magic happen. Remove the twine you had and it should maintain its shape. Slice the end piece and gaze upon your creation. If you can see a red smoke ring around the meat, this is perfectly smoked. You may not see a smoke ring, this is perfect too. The smoke ring is natural identifier of the smoke penetration. In a cooking competition we want to see this as an example of a, to the letter perfect smoking job. If there is no smoke ring, rest assured that the smoke did in fact do its job. Smell your shirt, and you will recognize that the smoke penetrated you, and you weren’t in a closed pit for 4-5 hours directly absorbing it. Lack of a smoke ring is okay. Your cut of beef has a natural grain to it. Like a piece of wood, you can clearly see on this cut of beef the direction the grain runs in. Note: This cut of meat and almost every other type of similar smoked meat should always be sliced against the grain. Keep this in mind if you want a tender meat. Using a butcher knife or a carving knife put your blade on the meat, perpendicular to the grain, and begin slicing. Your slices should be about a ¼ inch in thickness, if you like a thicker slice, or want a shaved slice then go for it. Slicing against the grain will make the meat tenderer to the bite. If you cut with the grain you will make a lot of people angry as they gnaw uncontrollably on your finished product. Finally, you want to use every inch of your knife in the cutting process. With the hilt of the knife and your hand starting as close to meat as you can, apply pressure as you slowly draw the knife back. A long carving knife will allow you to finish cutting each slice as reach the bottom of the roast. Your goal is one pass of the blade per slice, without using the sawing mechanism some people try to use. This really gives you a pretty looking cut to plate off. Your finalized cook will be delicious and you can decide to complete the meal with some oven roasted or grilled root vegetables. Compliment the dish with a classic porter, stout, cabernet or an unsweet iced tea, and don't forget to enjoy it!